Since first being shown at Apple’s Worldwide Developers Conference in 2000, the Harman Kardon Soundsticks speakers have been much admired. They were launched at WWDC as Apple wanted speakers to complement its translucent G3 iMac. 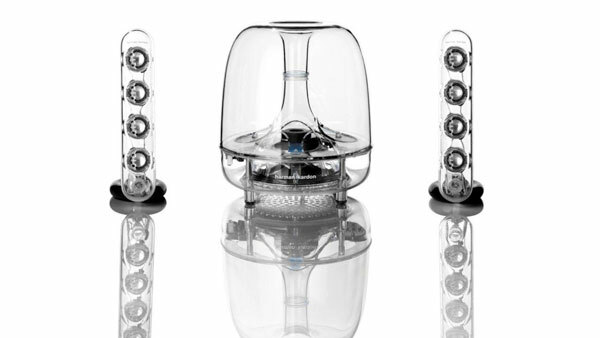 Not only did Apple want Harman Kardon to make them, it also handed the company the design. A Jonathan Ive design no less, that so impressed the Museum of Modern Art that they are part of the museum’s permanent collection. The design has been through several variations since 2000, and is now available in a wireless version called – believe it or not – Soundsticks Wireless. When Harman Kardon say wireless here, what they mean to say is that the speakers will stream sound from phones, portable music players, tablets, computer wirelessly via Bluetooth to the Soundsticks. There are wires between the satellite speakers and the subwoofer. The Harman Kardon Soundsticks Wireless are available now, and have an RRP of $329. Though you could probably find a better price than that.